Successfully Added 4 E27 RGBW LED Bulbs With Remote - 6 Watt, 500 Lumen, 30000 Hour Life, Adjustable to your Shopping Cart. 30,000 Hour life cycle means these 6 Watt LED Bulbs will pay for themselves in energy savings. Easy to use remote control lets you adjust the lights in any combination. Could you be paying less for electricity? Want to do more to help the environment? If the answer was yes then you should look at investing in low energy LED light bulbs. These 6 Watt LED bulbs emit the same amount of light as a standard 45W incandescent bulb, but use a fraction of the electricity. They last up to 30,000 hours and will drastically reduce your electric consumption saving you loads of money in the processes. With a standard E27 screw thread fitting they are suitable for most light fittings and lamps around the home or office. The light they emit can easily be adjusted from up to 10 meters away by the 2.4Ghz remote controller. This lets you adjust the lighting without getting out of your seat. 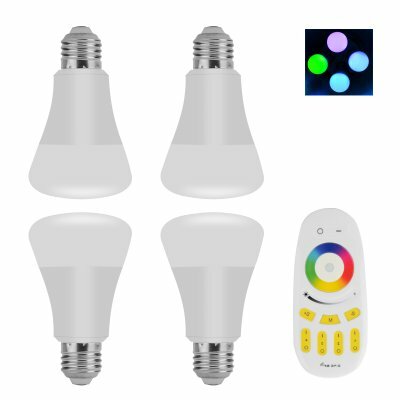 The bulbs can be controlled individually or as a group of 4 from the one controller so you can set the perfect mood by adjusting the brightness and color of each light as you see fit. Unlike other low energy bulbs ,such as CFL, these LED lights take no time to warm up so you instantly get a strong bright light as soon as they are switched on. With RGBW LEDs you can select from a full spectrum of colors so creating the right atmosphere for a romantic dinner or brining some festive lighting to your Xmas party is quick and easy. This pack of 4 LED bulbs is comes with a 12 months warranty and is brought to you by the leader in electronic devices as well as wholesale LED light bulbs..